HDFS is structured similarly to a regular Unix filesystem except that data storage is distributed across several machines. It is not intended as a replacement to a regular filesystem, but rather as a filesystem-like layer for large distributed systems to use. It has in built mechanisms to handle machine outages, and is optimized for throughput rather than latency. Datanode - where HDFS actually stores the data, there are usually quite a few of these. 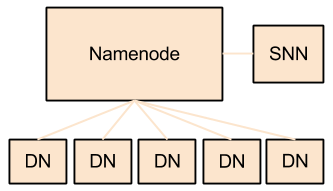 Namenode - the ‘master’ machine. It controls all the meta data for the cluster. Eg - what blocks make up a file, and what datanodes those blocks are stored on. Secondary Namenode - this is NOT a backup namenode, but is a separate service that keeps a copy of both the edit logs, and filesystem image, merging them periodically to keep the size reasonable. Data can be accessed using either the Java API, or the Hadoop command line client. Many operations are similar to their Unix counterparts. Note that HDFS is optimized differently than a regular file system. It is designed for non-realtime applications demanding high throughput instead of online applications demanding low latency. For example, files cannot be modified once written, and the latency of reads/writes is really bad by filesystem standards. On the flip side, throughput scales fairly linearly with the number of datanodes in a cluster, so it can handle workloads no single machine would ever be able to. Failure tolerant - data can be duplicated across multiple datanodes to protect against machine failures. The industry standard seems to be a replication factor of 3 (everything is stored on three machines). For more information about the design of HDFS, you should read through apache documentation page. In particular the streaming and data access section has some really simple and informative diagrams on how data read/writes actually happen. An API for writing MapReduce workflows in Java. A set of services for managing the execution of these workflows. Map tasks perform a transformation. Reduce tasks perform an aggregation. Notice that the output to a map and reduce task is always a KEY, VALUE pair. You always output exactly one key, and one value. The input to a reduce is KEY, ITERABLE[VALUE]. Reduce is called exactly once for each key output by the map phase. The ITERABLE[VALUE] is the set of all values output by the map phase for that key. Counter intuitively, one of the most important parts of a MapReduce job is what happens between map and reduce, there are 3 other stages; Partitioning, Sorting, and Grouping. In the default configuration, the goal of these intermediate steps is to ensure this behavior; that the values for each key are grouped together ready for the reduce() function. APIs are also provided if you want to tweak how these stages work (like if you want to perform a secondary sort). Here’s a diagram of the full workflow to try and demonstrate how these pieces all fit together, but really at this stage it’s more important to understand how map and reduce interact rather than understanding all the specifics of how that is implemented. What’s really powerful about this API is that there is no dependency between any two of the same task. To do it’s job a map() task does not need to know about other map task, and similarly a single reduce() task has all the context it needs to aggregate for any particular key, it does not share any state with other reduce tasks. Taken as a whole, this design means that the stages of the pipeline can be easily distributed to an arbitrary number of machines. Workflows requiring massive datasets can be easily distributed across hundreds of machines because there are no inherent dependencies between the tasks requiring them to be on the same machine. If you want to learn more about MapReduce (generally, and within Hadoop) I recommend you read the Google MapReduce paper, the Apache MapReduce documentation, or maybe even the hadoop book. Performing a web search for MapReduce tutorials also offers a lot of useful information. To make things more interesting, many projects have been built on top of the MapReduce API to ease the development of MapReduce workflows. For example Hive lets you write SQL to query data on HDFS instead of Java. Hadoop MapReduce comes with two primary services for scheduling and running MapReduce jobs. They are the Job Tracker (JT) and the Task Tracker (TT). Broadly speaking the JT is the master and is in charge of allocating tasks to task trackers and scheduling these tasks globally. A TT is in charge of running the Map and Reduce tasks themselves. When running, each TT registers itself with the JT and reports the number of ‘map’ and ‘reduce’ slots it has available, the JT keeps a central registry of these across all TTs and allocates them to jobs as required. When a task is completed, the TT re-registers that slot with the JT and the process repeats. Automatic retries - if a task fails, it is retried N times (usually 3) on different task trackers. Blacklisting a bad TT - if the JT detects that a TT has too many failed tasks, it will blacklist it. No tasks will then be scheduled on this task tracker. Speculative Execution - the JT can schedule the same task to run on several machines at the same time, just in case some machines are slower than others. When one version finishes, the others are killed. Here’s a simple diagram of a typical deployment with TTs deployed alongside datanodes. For more reading on the JobTracker and TaskTracker check out Wikipedia or the Hadoop book. I find the apache documentation pretty confusing when just trying to understand these things at a high level, so again doing a web-search can be pretty useful. Here I am using this version hadoop 1.0.3. If we open these files, we can see all the default properties.